Singapore-based parcel delivery service provider Ninja Van, which manages parcel delivery networks in Indonesia, Malaysia, Philippines, Singapore, Thailand and Vietnam, has raised more than US$85 million in its series C funding round. A report in Singapore's Today newspaper explained that a startup company embarks on series C funding when it is past its beginning, improvement and development stages, and is looking to build and scale-up fast. Investors are usually bigger players in the market, such as investment banks, private equity firms and hedge funds. Among the investors for Ninja Van’s latest round of funding was Europe’s DPD Group, a parcel delivery network belonging to France-based GeoPost. Other investors included Japan’s corporate venture group YJ Capital, United Arab Emirate’s private equity investor The Abraaj Group, and early stage venture capital firm Monk’s Hill Ventures. Ninja Van, which was established in 2014, is a Southeast Asian logistics startup, which manages parcel delivery networks in Indonesia, Malaysia, Philippines, Singapore, Thailand and Vietnam. The company is planning to expand its network to serve customers in the wider SEA region. 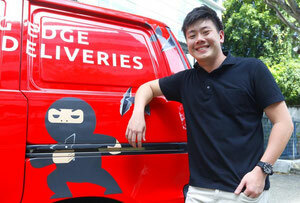 Its chief executive Lai Chang Wen, 30, said the money will go towards “further improving technology and operational capabilities to help Ninja Van continue our drive in offering hassle-free delivery solutions to businesses of all sizes”. The company currently employs more than 1,000 staff across the region.